I used a hacksaw with my right hand to cut off a piece of plastic from my car. This feat was all the more risky because I am left handed. Halfway through the procedure I realized I wasn’t wearing my glasses! Said plastic seems to have served no crucial purpose. It had been dragging underneath the car, and so I had duct taped it to the bumper, but duct tape needs to be applied copiously in order to withstand wind, rain, and gravity, so the plastic once again had begun to scrape the road. I’ve driven to the city without the part and all is well. I even managed to arrive on time for a presentation by Andrea Lunsford. She spoke about rhetoric and new media literacy. 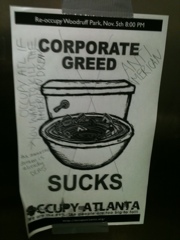 The sign above is from November 5–the mayor of Atlanta had already shut down the Occupy camp when this sign was put up. I found it on the inside of a bathroom stall at the university where I’m a TA. There was a whole debate going on in scribbled writing about the American Dream and how it’s dead. Two weeks have passed since streams of police cars, helicopters, and ground troops shut down Occupy ATL. Since then, protests at Berkley and Davis have produced vile reactions from authorities. Even though the Davis chancellor has so far declined to resign, and though she has apologized, she needs to take stronger responsibility for how the police pepper sprayed the students.